Every major asset class is headed for a negative or little changed return year to date. Cash in the form of money market funds is the only asset that have had a decent positive return in 2018. Investors blame the unwinding of Federal Reserve stimulus and the possible end of the economic expansion. Even in the worst of times for financial markets, there's usually a few ways to profit. Well, not this year. In fact, in 2018, just about every single asset class one can invest in — from stocks around the globe to government debt to corporate bonds to commodities — have posted negative returns or unchanged performance year to date. Even during the financial crisis in 2008, government bonds and gold worked. And in 2015, when a majority of asset classes finished in the red, at least stocks and Treasurys squeaked out positive returns. After Thursday's rout, the S&P 500 looks like it is ending the year on the lows, down 9.6 percent and counting for 2018. A look at the biggest year-to-date exchange-traded fund winners on Morningstar reveals only the risky funds that short the markets or bet on volatility and commodities using leverage. So much of the bull market in risk assets over the last nine years was linked to Federal Reserve stimulus put in place to save the economy during the financial crisis. Low rates and other easing measures fueled a boom in stocks by enabling companies to borrow and aggressively buy back their own shares. Not to mention that the easy borrowing fueled their expansion. And a lot of the easy money injected into the system found it's way into stocks because there was no alternative, lifting equity valuations to high levels. Now that process is unwinding. "All assets have underperformed in 2018 simply because the Fed accelerated the process of tightening monetary policy with a two-pronged approach of both hiking rates and reducing the balance sheet," Ian Lyngen, head of U.S. rate strategy at BMO, said in an interview. "So it follows intuitively that it would be difficult to find pockets of outperformance when the Fed is actively trying to deflate asset bubbles." That's why the market fell to new lows this week when the Fed raised interest rates by a quarter point on Wednesday and turned especially weak specifically when Fed chief Jerome Powell said the unwinding of the central bank's balance sheet would continue at its current pace. "We continue to expect the Fed will hike next year until they break something. The reversal in equities is not the magnitude that has historically led the Fed reverse their policy, so there's still room to go," Lyngen said. When the success of every asset class is linked to low interest rates and Fed stimulus, when that reverses, there's nowhere to hide. In the past when rates increased (hurting bonds), the economy was strong enough to boost earnings for companies and therefore equity prices. That may not be the case right now. End of the business cycle? "We are at the end of the business cycle," said Madison Nestor, a senior analyst at PNC Investments. "We've been in an economic expansion for the past seven to eight years, which is already very long. A recession is likely to come within the next two years." It's not just that nothing's working, investors are also for the first time in a long timelosing a lot of money. 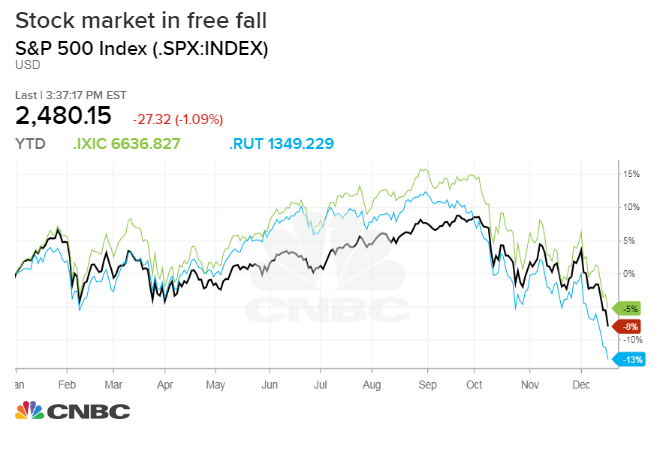 The Russell 2000 and the Nasdaq Composite both dipped into bear market territory this week. The real test for this market will come when investors check their 401(k) balances in January and see the negative returns. They could dump stocks further, putting more pressure on the market.